Thanks to everyone who came out and participated in the DMV Season 2 Finals at Crabtowne USA! James Daley and Justin Day, you guys did a great job of ensuring the day ran smoothly and was filled with fun! League members we appreciate your participation and respect your feedback. Our team of volunteers will continue to work hard to ensure you have the best possible pinball experience. Don’t hesitate to e-mail us at dmvpinball@gmail.com with your questions and suggestions for Season 3. Overall in Points: Justin Day! See complete results on the IFPA website. Camila Dias was the lucky winner of the Black Pyramid pinball machine! Enjoy!! Congrats to our Inter-Season Tournament Qualifiers! Mark your calendars for July 25th and join us at Town Hall in College Park! Last Chance Qualifying starts at 1:30PM the day of the tournament. The main tournament format will be a three or four strike brakelope tournament depending on attendance. Main tournament starts at 2 PM. There will be a side tournament as well beginning at 1 PM. Side tournament, qualifying will be high score then top 4 or top 8 depending on turnout will play best of 3 head to head. 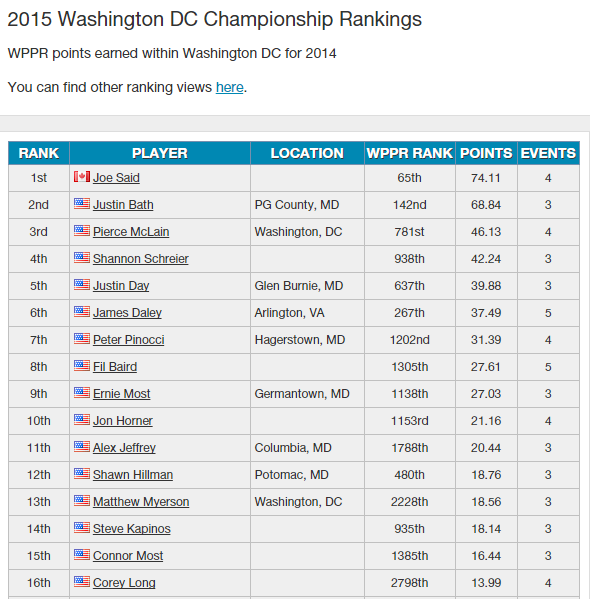 If you’re not on this list and should be, please let us know at dmvpinball@gmail.com. Black Cat : Camila Dias, Pierce McLain, Jon Long, Matt Myerson, Bobbie Dougherty, Jon Horner, Katie Kaufmann, Corey Long, Chris Keller, Jessie DeVincent. Mighty Mikes: Don Kraper, Matt Wycoff, Joe Said, Austin Mackert, James Daley. Lymans Tavern: Timothy Brown, Steve Stakem, Fil Baird, Holly Eney, Roy DeJarnette, Shawn Hillman, Jamie C., Cristin Gasson, Michael Palinkas, Jon Blundell, Andrew Edmondson, Brian Jackson, William Brown. Week 1 of Season 3 is scheduled to kick off on September 8th and will run through November 2nd. Our Midseason tournament has been tentatively scheduled for October 17th, Finals on November 14th, and the Interseason is scheduled for November 21st. Sign-ups preferred via paypal (coming soon!). Dues will remain $40 per member and we will again be giving away a pinball machine at the finals! DMV is thrilled to announce our new league location at Holy Frijoles in Baltimore! Thanks to Geoff Danek for welcoming us and volunteering to be the league officer at this location. He has a great lineup of pins including Lethal Weapon 3, World Cup ’94, Terminator 2, Creature, and Elvira Party Monsters. DMV will host league at Holy Frijoles on Wednesday nights at 8:30 PM. Stay tuned for details about the Pre-Season Tournament at this location! Thank you Pierce McLain for volunteering to add a Monday afternoon league at Lyman’s Tavern to cater to our industry people! DMV Season 3 welcomes back Town Hall as a league location. Thanks to Shawn Hillman for volunteering to be the new Town Hall league officer. See complete schedule below. THE FLIPPIN’ NEWS, SEASON 2, FINALS EDITION! One final round to go before Season 2 standings are history. Check out your standings today! 12:30pm – Player check in and side tournament starts on Black Night 2000. 1PM– final call for check in, groups for the one game ” last jockey for position” get drawn. 1:45PM-2PM final seedings are set, top 16 are in A, if there are absences in A the next highest seed has the option to play in A or remain in B division. 2PM– Finals for A start. The top 4 seeds in each of the 4 four player groups has choice of game or order. The first 4 games picked in A will be used exclusively in A up until the final 4 remaining in B. 2:15PM– B division elimination games start to establish 16 players in B. All participants not in A have a chance to qualify for B finals. Top 16 remaining in B play in 4 four player groups, highest seed has choice of game or order, lowest finisher in each group goes to a last chance play in. All remaining players will play one or two elimination games for 4 spots. 8 people will play for a last chance to get in the top 16 in B then B division finals start. B players will retain their seed if they lose the first game but win the last chance game. For both A and B division 4 player groups will be scored 4,2,1,0. A division will only play 4 player groups. For B division 3 player groups will be scored 4,2,1 and 2 player groups will be scored 4,2. Looking forward to seeing everyone this Saturday. DMV will again be giving away a pinball machine to one lucky paid member! Check in with Cristin to verify your name is in the drawing. The winner will need to make arrangements to pick up their new Black Pyramid pinball machine with Cristin ASAP. Thanks! Congrats to our Inter-Season Tournament Qualifiers! Mark your calendars for July 25th and join us at Town Hall in College Park! Details to follow. 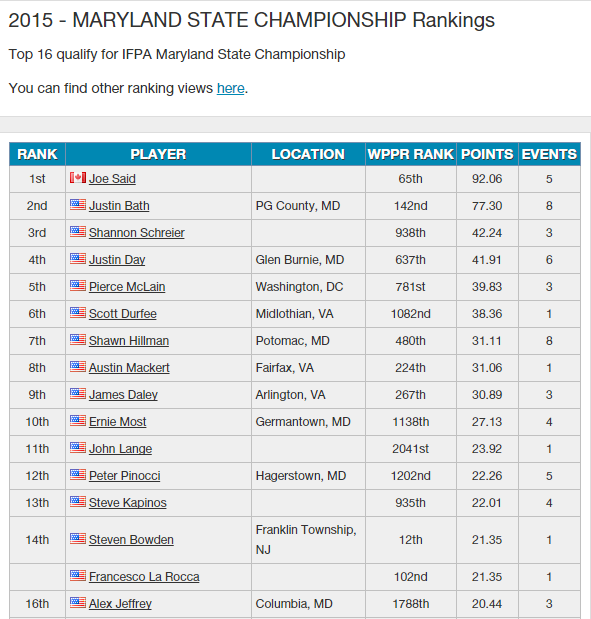 If you’re not on this list and should be, please let us know at dmvpinball@gmail.com. Week 1 of Season 3 is scheduled to kick off on September 8. Stay tuned for exciting updates. This is it folks! Week 8 is upon us. Congrats to Justin Day for moving into 1st place. Check out your standings today! Reminder there will be no mid-season tournament for Season 2. Bonus Game qualifiers will be eligible for the Inter-Season Tournament scheduled for July 25 at Town Hall in College Park MD! Get out to a location and qualify this week! 12:30PM – side tournament begins on BK2000. First entry is free, each additional entry is 2$. One game, no finals, winner takes all, unlimited attempts. 1PM- check in for ALL DMV players. Unlike last finals where their was a staggered time for A,B and C division. All DMV players are requested to show up at 1PM to check in. 1:15 – 1:30 PM- all checked in players will be entered into the league software and drawn into random groups for one last jockey for position. Players will play one game in random groups with regular league scoring 3,2,2,1/3,2,1/3,1 depending on if it’s a 4,3 or 2 player group. 2PM. A division finals are set. Top 16 players are in A division, if some of the top 16 are not in attendance the highest B division players will have the option of playing in A or remaining in B. Once A division is set the next 16 players will be the B division seeds. They will play in four-4 player groups, one game, seed chooses game, lowest finisher in each group goes to a last chance play in game. If your not in the top 16 in B you will be playing elimination games down to 4 remaining. The 4 survivors of the rest of the pack will play one head to head games against the 4 lowest finishers in the 4 player groups to finalize 16 players in B. Once we’re down to 16 players in B, first round is 4 -4 player groups, one game, lowest finisher in each group is eliminated. Then round 2 is four, 3 player groups, one game lowest finisher is eliminated. Then round 3 is two, 4 player groups, one game, lowest finisher is eliminated. Round 4 is two, 3 player groups, lowest finisher is eliminated. Round 5 is two, two player groups, one game, lowest finisher is eliminated. Round 6 is the final two, one game for the victory. Higher seed always chooses game or order. One player can only choose the same game twice. With seeding being so important it’s important to know the tie-breaker rules. If two players are tied for points their is a series of tie-breakers. Fourth tie-breaker is earlier 11’s. As an example, Jon Horner currently has 54 points and Shannon Schreier has 53 points. If Shannon can make up one point on Jon they would be tied on points and it would go to a tie-breaker. Both Jon and Shannon have 2 weeks at 12 points so it would go to the second tie breaker. Shannon’s first 12 was in week one, Jon’s first 12 was in week 4 so Shannon would be the higher seed due to tie-breaker. Last news we heard, there were tickets available for Pinburgh if any DMV’ers are interested! Only two weeks remain and as of last week each location is now represented by players in the top 16! The point distribution is super tight so much can still change. Check out your standings today! None Shall Pass finals were held at Lyman’s Tavern this past Sunday. James Daley the tournament director allowed a few to pass and ran an awesome tournament that included the inventive formats we’ve become accustomed to expect from the Mayor. Francesco La Rocca from NYC took 1st while 2nd place went to Andrew Pancoast from NC and 3rd place to DMV Crabtowne’s Jake Peterson. An amazing 48 pinball competitors turned out for Pinholics hosted by Kevin Stone this past Saturday! Congrats to Austin Mackert with the win in the main tournament followed by Andrew Pancoast in 2nd, Steve Kapinos in 3rd, and Dave Hubbard in 4th. Andrew Pancoast won the side tournament while 2nd place went to DMV’s own Justin Bath, 3rd to Gilles Melanson, and 4th place was Austin Mackert. July 11th, CrabTowne12:30PM – side tournament begins on BK2000. First entry is free, each additional entry is 2$. One game, no finals, winner takes all, unlimited attempts.1PM– check in for ALL DMV players. Unlike last finals where their was a staggered time for A,B and C division. All DMV players are requested to show up at 1PM to check in.1:15 – 1:30 PM– all checked in players will be entered into the league software and drawn into random groups for one last jockey for position. Players will play one game in random groups with regular league scoring 3,2,2,1/3,2,1/3,1 depending on if it’s a 4,3 or 2 player group. 2PM. A division finals are set. Top 16 players are in A division, if some of the top 16 are not in attendance the highest B division players will have the option of playing in A or remaining in B. A division group stage will be the same essential format as the first season finals, first round is 4 groups of 4, 3 game set, 4,2,1,0 scoring, bottom 2 are eliminated. Then two groups of 4, 3 game set, bottom 2 eliminate, then the final 4. 4 games will be used exclusively for A division up to the final 4 in B division. Once B division is at the final 4 all games are available for B division. 2:15 PM– all remaining players will start the B division tournament. No C division. B division tournament will have seeding advantages. A more detailed explanation of B division tournament format will be in the next newsletter. Uh oh…Have you heard the news? Crabtowne players have finally been dethroned. Congrats to the new leader, Mr. James Daley (they’re coming for you). Check out your standings today! That’s right. DMV is now on Instagram! Thanks to Justin Day for setting this up. Please share all your awesome pinball moments..high scores, stuck balls, great food and friends at https://instagram.com/dmvpinball/. And don’t forget to hashtag photos with ‪#‎dmvpinball‬ !! If you want to schedule qualifying prior to June 14th, or if your one of the games in progress schedule finishing off the qualifying games, shoot an e-mail to mayor@townhallpinball.org. The first Pinholics meeting of the year has been submitted to IFPA for June 13th. We have three events going on for this meeting. Important Change: Doors open at 2pm and the Main tournament will start at 4pm to accommodate changes. Late night party has been retired so figure we’ll start earlier to finish at a reasonable time. 1) Main tournament – now a 4 strike tournament, earlier starting time @ 4pm. Top 4 paid out (changed from 3 players). 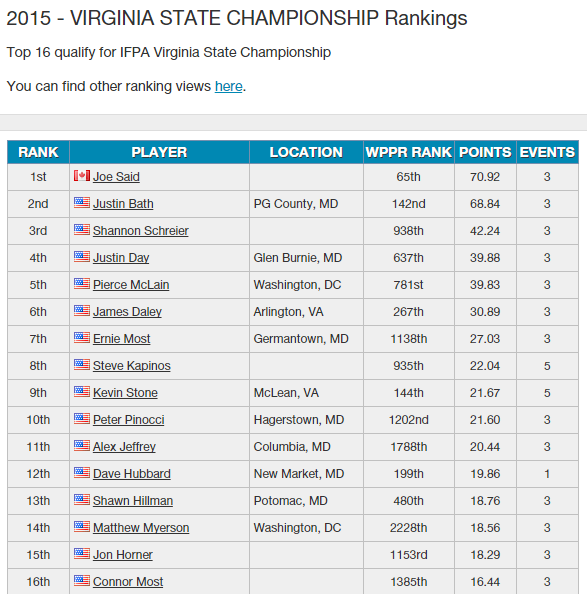 2) Side tournament – now an IFPA ranked tournament. 3 solid state games will be used in qualifying and playoffs. Top 4 qualifiers on each game receive points (4/2/1/0). Points are added across all 3 games. Bonus 1 point for players that qualify in two games, 3 bonus points for players that qualify in all three games. Seeding established based on total points, Playoffs are survival mode similar to PAPA circuit. Bottom 2 seeds start, winner advances to next player. Seeding ties will be resolved via coin-flip. Qualifying starts at 2pm, tentatively stops for first 4 rounds of main tournament, then restarts. Finals will start at 9pm rather than completion of main tournament. Top 4 paid out, with prize going to top qualifier of each game. Games will be Paragon, Stars and Mata Hari. 3) James Daley will be playing None Shall Pass games versus any player that wants a last chance at qualifying and playing in the playoffs on Sunday, June 14th at Lyman’s Tavern @ 1pm. Season 2 finals will be held at Crabtowne USA on July 11. Keep an eye out for details on payouts, format, start time, etc in the next week. Crabtowne USA players are still holding onto to their lead in the standings with Lyman’s Tavern players close behind. Check out your standings today! Reminder there will be no mid-season tournament for Season 2. Bonus Game qualifiers will be eligible for the Inter-Season Tournament. Details will be shared next week. Please let us know if you think your name should be on this list! Some of our locations (Black Cat and Mighty Mikes) have all regular players already qualified so don’t hesitate to show up on their league nights for a chance to enter the tournament! Lymans Tavern: Timothy Brown, Steve Stakem, Fil Baird, Holly Eney, Roy DeJarnette, Shawn Hillman, Jamie C.
We are working to get an updated scoresheet to clarify points but until then here’s a few tips/general rules. **If you are playing in a group with a guest or two remember guest’s scores do not count towards points. Do not include them in the overall group number. For example if you are in a 4-player group where one player is a guest, the guest gets zero points and the league members are scored as a 3-player group. Email any questions to dmvpinball@gmail.com. Season 2 finals will be held at Crabtowne USA on July 11. Keep an eye out for details on payouts, format, start time, etc in the next couple weeks. Gamers behind the Replay Foundation & PAPA are taking over the David L. Lawrence Convention Center in Pittsburgh, PA and filling it with more than 700 arcade and pinball machines, over 2,000 retro console games, table top games, a showcase of new products by game developers, a full lineup of seminars, magicians, live musicians, balloon artists, face-painters, competitions offering over $110,000 in prize money, and more! The ReplayFX Arcade & Gaming Festival will feature the largest public collection of full-sized pinball, arcade, tabletop, and console games anywhere in the solar system, and all games are free to play with the price of admission! Attendees are also invited to attend a series of seminars dedicated to gaming and its associated tech-culture, browse merchandise in the marketplace, watch the world’s greatest arcade masters compete in Kong Off 4, the Donkey Kong World Championships, and to compete themselves in Walter Day’s Replay World Championship, a classic arcade tournament designed for novice and expert players alike. Spectators are also welcome to watch the world’s greatest pinball players compete on a wall of 50-inch televisions in Pinburgh, the largest pinball tournament in history. ReplayFX will include six live bands, a cosplay contest, inflatable obstacle courses, and more in a show floor packed with over 125,000 square feet of entertainment! The Pittsburgh Symphony Orchestra is also getting in on the gaming action and performing an evening of Final Fantasy Music at nearby Heinz Hall. Over $110,000 will be at stake for the competitive player. Thousands of games will be available for the casual fan. A family-friendly atmosphere will be available for the kids, and no one has to leave the galaxy to attend! Becoming an expert at the silver ball can be intimidating at times. Pinball machines are complex critters with something to learn all the time, but as the great Lau “flipper” Tzu once said ” The journey to the Wizard mode starts with a single plunge”. Before you play a game ask yourself, is there a skill shot? Is there a super skill shot? Are their multiple options for skill shot and super skill shot? What does the skill shot or super skill shot get me? How long is the ball save and what difficult and dangerous shots can I try to check off before the ball save expires? If I fail on the skill shot can I drain and get another shot at the skill shot? For example AC/DC at Lyman’s and Town Hall has a basic relatively easy skill shot that is quite important because you get a VIP pass for each successful skill shot. Have the ball roll down the lit lane and you get the skill shot points and one VIP pass. Standard protocol is to have the lit lane be the center. A flip of the right flipper moves the lit lane one to the right. One flip on the left flipper moves it one to the left. Be alert because the lanes on AC/DC register quite high! Ask yourself…once the skill shot is over do I have enough ball save time to take a few pot shots at the risky TNT targets to progress to Album MultiBall? ( this will depends on how long the ball pops around in the pop bumpers ). On Road Show at Mighty Mike’s the first skill shot gets you points, a souvenir, and will start a city mode. Fail and you can have a second shot at it. An advanced maneuver on Road Show is to plunge to the pop bumpers and hope it changes from the New York City ( not that lucrative ) to Miami( can be quite lucrative) . Pop bumper change to Miami and then ball save drain to re-plunge to Miami ( nice when it works ). For Addams Family ( Black Cat and CrabTowne ) mastering the skill shot is quite important because with extra balls and skill shot opportunities with locked balls, it’s not uncommon to have 6 or more skill shots in a game. First skill shot is 2 million, 2nd is 3, 3rd is 4 millions and 4th and every subsequent skill shot is 5 million. Make 3 out of 6 skill shots and that’s 9 million, make 6 skill shots and its 24 million. When you consider how many Addams league night games get decided by 15 million, you can appreciate the value of the Addams Family skill shot. Also Addams Family has a ball save of sorts. If you fail on the skill shot but don’t hit a scoring switch you get the ball back for another attempt. Getting the ball back for another skill shot attempt is vital in Addams so all players, if they want to improve, should learn how to do that. When should I ignore the skill shot altogether? For Twilight Zone ( Black Cat and CrabTowne ) the skill shot is universally ignored because it shoots the ball to the very dangerous pop bumpers for very little reward and no ball saver in TZ. Thanks to all our volunteers and players for making Season 1 a huge success! And thanks for joining us again for Season 2. Welcome to our new players! Let us know how we’re doing and what information you need to to make your experience in our league AWESOME. We appreciate all your feedback and suggestions. We are working on re-organizing and providing you with the most up-to-date, accurate information possible and appreciate your patience. Stay tuned! Crabtowne USA represent! Congrats to you guys for taking a strong lead in standings as we enter our 4th week. Thanks to all the league officers and subs who keep our standings current. Email us at dmvpinball@gmail.com with any questions or corrections. Don’t forget with DMV you have multiple opportunities to play! Choose any one of our four locations: Crabtowne USA, Lyman’s Tavern, Black Cat, or Mighty Mike’s for your official league points but come to as many league nights as you want to qualify in the bonus game which will make you eligible to participate in our inter-season tournament! Of course you can always join in on any league night just for fun too…and bring a friend! League is always free (except coin drop) to anyone who just wants to check it out. Join us! Here’s a recap of our first 3 week’s bonus game qualifiers. There will be no mid-season tournament for Season 2 to give our officers ample time to plan and organize an amazing inter-season for our members. Details will soon follow. Please let us know if you think your name should be on this list! For those of you who haven’t yet qualified: Keep trying and PLAY BETTER! Season 2 finals will be held at Crabtowne USA on July 11. Keep an eye out for details on payouts, format, start time, etc in he next couple weeks. A DMV pinball tip: Experiment a little, do different things when you VUK (Vertical Up Kicking). 3- hold the flipper upThe standard response from many players seems to be 1- flip. On some VUK’s that is the safest and easiest choice. But on other VUK’s the don’t flip choice is near or at 100% effective. So for example on the Addams Family if the ball is in the Swamp VUK and you choose to respond by the flail flip, the ball is directed at speed into the middle of the play field and potential danger. But if this Addams Family has a Swamp VUK that allows the don’t flip option you can let it come out of the Swamp VUK, don’t flip the right flipper, cradle it on the left flipper, and have a controlled shot to the Chair. Another Swamp VUK example would be if GREED is spelled out and locks are lit, or quick multi ball is ready or extra ball is ready to be collected then option 3 hold the flipper up is the best option IF the machine allows it. Do you want an uncontrolled flail at the extra ball from the right flipper or would you prefer a ball cradled on the right flipper to take a controlled shot for that extra ball. The Black Cat Addams Family Swamp VUK allows option 3 most of the time but is not 100%. It’s important to remember though that option one , the flip from the VUK is never 100% safe either.One of the first things you should do when your playing a practice game with a game that has a VUK is see how it responds to options 1,2, and 3. In certain game situations it might make the difference between getting that extra ball or getting Vertical Up Kickered. 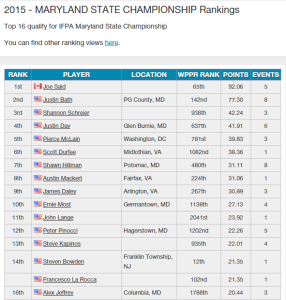 Top 16 will qualify to play in the Maryland Championship for a spot to play at the IFPA Nationals! Keep playing and rise to the top! 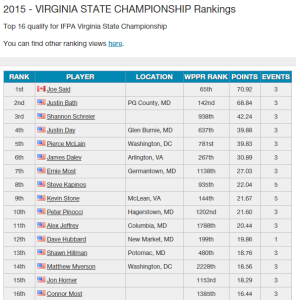 Top 16 will qualify to play in the Virginia State Championship for a spot to play at the IFPA Nationals! 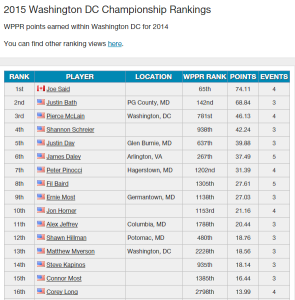 Top 16 will qualify to play in the DC Championship Series for a spot to play at the IFPA Nationals!